BERLIN (DE), February 2019 — Researchers from Charité – Universitätsmedizin Berlin have discovered a protective mechanism used by the body to protect intestinal stem cells from turning cancerous. The body’s innate immune system was found to play a pivotal role in this regard. The researchers were able to demonstrate that, rather than having a purely defensive role, the immune system is crucial in maintaining a healthy body. The study is published in Nature. Inside our bowels, the cells of our intestinal cell walls meet foreign materials such as bacteria, foodstuffs and the breakdown products of digestion. Both of these worlds – that of our bodies and that of the outside world – are in direct contact, continually exchanging information. This direct contact is of crucial importance to our bodies, as many of the environmental factors we are exposed to (such as certain types of bacteria or essential nutrients) are beneficial or even vital to our health. However, contact with the environment can also have a negative impact on our bodies. Certain foreign substances, for instance, can trigger genetic changes inside the epithelial cells lining our intestinal walls. The accumulation of this type of DNA damage, particularly when it occurs inside epithelial stem cells, can lead to bowel cancer. To prevent this progression to cancer, cells have the capacity to repair DNA damage. Where damage is too extensive, they can commit “altruistic cell suicide” (apoptosis). Until now, scientists had assumed that stem cells triggered this repair mechanism independently. However, the study led by Andreas Diefenbach, Ph.D., director of Charité’s Institute of Microbiology, Infectious Diseases and Immunology, comes to a different conclusion. It shows that the immune system is capable of enhancing the DNA repair mechanism in damaged stem cells, thus preventing progression to bowel cancer. Working with other researchers, Prof. Diefenbach and his team were able to show in a mouse model that cells of the innate immune system are capable of recognizing genotoxic environmental factors present in the bowel. Among these are certain glucosinolates, natural components of plants. Once the cells of the innate immune system detect damaging glucosinolates, they send out interleukin 22, a type of cellular messenger. This, in turn, enables the epithelial stem cells to detect potential DNA damage earlier and repair it faster. For the immunologist, these findings are not only evidence of a previously unknown regulatory system used by the body to protect itself against bowel cancer, but they are also evidence of the fact that the immune system’s functions are far more complex than that of a simple defense mechanism against pathogens. “The immune system monitors both the healthy growth and function of different organs in the body,” Prof. Diefenbach explained. He and his team would like to use future research studies to explore the complex interaction between food components, intestinal flora, the intestinal wall and the immune system in greater detail. “It is here that we may find the key to why there are so many inflammatory disorders,” he said. 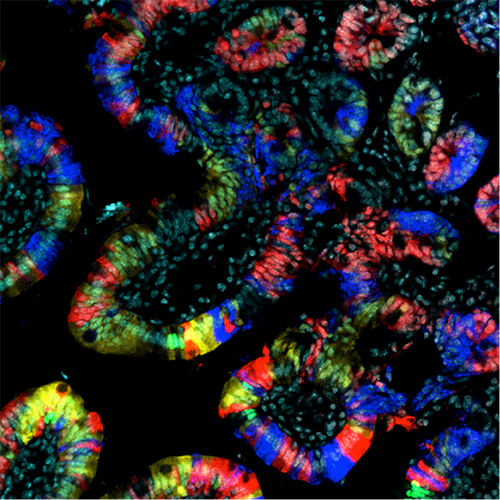 The uppermost cell layer of the intestinal wall, visualized using different fluorescent proteins (mouse model). Image courtesy of © Diefenbach/Charité.